Ariel Miranda is scheduled to start on Tuesday, but Ben Gamel won't be back till Wednesday or later. 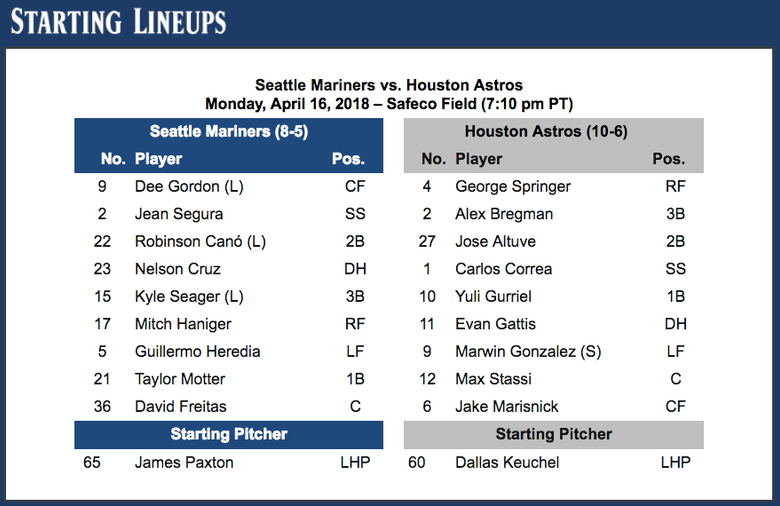 As of Monday afternoon, it appeared that lefty Ariel Miranda will get the start on Tuesday for the Mariners against the Houston Astros and outfielder Ben Gamel will be stuck in Tacoma for another day, possibly two. With the Mariners finally in need of a fifth starter for their rotation, they will turn to Miranda for at least one outing in the spot that belongs to Erasmo Ramirez, who is scheduled to also start on Tuesday for Class AAA Tacoma. “We are leaning towards Ariel Miranda,” Servais said. Miranda has made two starts — one for High-A Modesto and another for Class AAA Tacoma — posted a 4.00 ERA with five walks and seven strikeouts in nine innings pitched. Miranda made 29 starts and two relief appearances for the Mariners last season, posting an 8-7 record with a 5.12 ERA and a whopping 37 homers allowed. Why the qualifiers of “leaning” and “if he’s the guy out there?” Well, it could be due to the fact that Miranda isn’t actually on the 25-man roster and a move has to be made to add him. Meanwhile, Ramirez is fully recovered from the strained lat muscle he suffered in spring training. He’s now building his innings and pitch count up on his rehab assignment. The hope is that he will have a strong outing with the Rainiers on Tuesday night. “I’d love to see him get into the sixth inning,” Servais said. If that happens, Ramirez would return to the rotation on Sunday against the Rangers in Texas. As for the other expected roster move on Tuesday, it appears that won’t happen. It was expected that Ben Gamel would be activated from the disabled list and return to the lineup, particularly with the Mariners facing three right-handed starting pitchers in a row. But Servais said that Gamel will play at least one more game with Class AAA Tacoma on his rehab stint or possibly two. The Rainiers’ game in Sacramento was postponed Monday, meaning Gamel will play with the Rainiers on Tuesday at Cheney Stadium. This isn’t about building stamina for Gamel or getting a few games more for needed at-bats. “On the roster decisions and how they play out, I don’t want to get too far ahead of ourselves, really I’m just going to take it day to day,” Servais said. Ah, yes, the roster and the situation the Mariners find themselves in with a 44-year-old outfielder tenuously tethered to it. If/when Gamel ever comes back, he would be the starting left fielder on days when opponents start right-handed pitchers. Guillermo Heredia would start on most days when a lefty was starting against Seattle. It isn’t a strict platoon, but something like it. This is how it was set up going into the season, long before Gamel felt the pain in his oblique and Ichiro returned on a farewell tour. General manager Jerry Dipoto could “Jerry-mander” the roster to keep the iconic Ichiro around even with Gamel, Heredia, Dee Gordon and Mitch Haniger on the roster. He said last week on ESPN 710’s Danny, Dave & Moore show that they would carry five outfielders. The question of Ichiro’s future when Gamel came back always lingered. It now appears that the Mariners are stalling to avoid answering it for as long as possible. With a player like Ichiro, it seems like they will wait until it’s absolutely necessary. Servais said the team has entertained the possibility of carrying a seven-man bullpen, which wasn’t a consideration coming into the season. The Mariners always wanted to carry eight relievers. That premise becomes more difficult considering only Mike Leake has pitched seven innings or more in a start for the rotation. The Mariners also only have one scheduled off day — May 7 — until May 20. Dipoto was willing to shuttle bullpen arms back and forth from Class AAA Tacoma last season. And it’s something he could do again, but the relief arms with the Rainiers aren’t at the level of last season. If Ramirez’s outing goes well, the Mariners could immediately option Miranda back to Tacoma after his start on Tuesday, and then bring back Gamel in his spot. That would buy them four full days without having to make another move and keep them at eight relievers. If no one else gets injured, the Mariners and Dipoto might reach the tipping point when first baseman Ryon Healy is ready to return from the disabled list. He’s eligible to return on April 18 and progressing quickly from his sprained right ankle. Until then, the Mariners could carry five outfielders and avoid the awkward goodbye with Ichiro.